[Context and Motivation] Agile developments follow an iterative procedure with alternating requirements planning and implementation phases boxed into sprints. For every sprint, requirements from the product backlog are selected and appropriate test measures are chosen. [Question/problem] Both activities should carefully consider the implementation risk of each requirement. In favor of a successful project, risky requirements should either be deferred or extra test effort should be dedicated on them. Currently, estimating the implementation risk of requirements is mainly based on gut decisions. [Principal ideas/results] The complexity of the graph spanned by dependency and decomposition relations across requirements can be an indicator of implementation risk. In this paper, we propose three metrics to assess and quantify requirement relations. We conducted a study with five industry-scale agile projects and found that the proposed metrics are in fact suitable for estimating implementation risk of requirements. 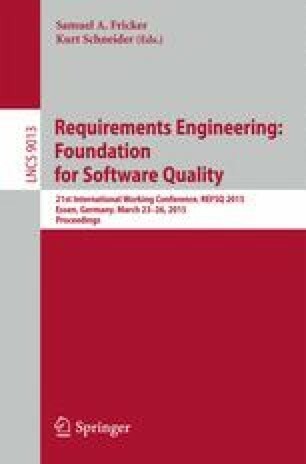 [Contribution] Our study of heterogeneous, industrial development projects delivers for the first time evidence that the complexity of a requirements traceability graph is correlated with the error-proneness of the implementing source code. The proposed traceability metrics provide an indicator for requirements’ implementation risks. This indicator supports product owners and developers in requirement prioritization and test measure selection.